In this post, I present the most important feature of DayTickler. I explain, for those of you who do not like lists and todos, that this feature can be used without first recorded your things to do. The whole point is to learn how to pair your brain with your gut. I often agree with Jeff Atwood, the author of the fabulous blog Coding Horror. I read his blog with great joy since 2004 (over 10 years, wow !!!). To-do lists that only allows you to empty your brain are useless. A useful tool must help you stay focused. It must simplifies the daily challenge to pair your brain with your gut. It should empower you to get the courage to act. The easiest way to create a moral obligation with yourself is to reduce your commitments to something simple. Here is a case where a long list of tasks is ineffective and gives the illusion of accomplishment. Engage only on what is important and easily achievable in the next 24 hours. I am of those, like Jeff Atwood, that set commitment by identifying the three things that need to be done today. After my three things are identified, it is at this moment, unlike Jeff Atwood, that I need a tool. I discovered that if I write my commitments, I am much more likely to achieve them. It is as if the act of writing my three things increase my moral obligation. In addition, the bond is even stronger if I schedule the period of day when I intend to achieve them. It is the ability to schedule my commitments that is the most powerful feature of DayTickler and what differentiates it from other to-do tools. I found no software that allows me to commit to tasks in this way. Calendars force me to explicitly set the hour. 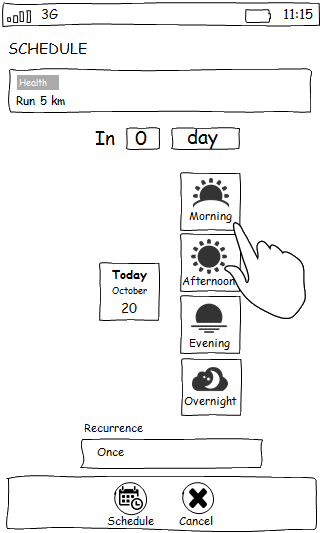 What I want is to specify a period of day (morning, afternoon, evening, overnight) with one simple finger touch. Other tools such as to-do lists, in addition to having the same constraint on time setting, make me see my three things through a long list of todos rather than a calendar view. Note, for those who do not like to-do lists, with DayTickler you can write down your daily commitments without first recording your things in a list. Even if your brain knows what your priorities are for the day, he has the annoying habit to prioritize the pleasure over taken commitments. Unconsciously (or conciously), the brain will try to forget about your schedule for the day. This is why, to refresh your moral obligation and to find the courage to pursue your commitments, you will need to consult your schedule several times during the day. By allowing you to stay focused, a tool like DayTickler justifies its value. At any time during the day, you can track your commitments and get a reward when you tick a commitment you have just completed.